The rumor went around that trains were throwing steel ball bearings from their wheels. Genuine steelies! Somebody said they saw one that a kid from Detroit brought up. So big that you couldn’t close your fist around it. Nobody else saw it, though. Nevertheless, we scoured the tracks for endless hours, turning over every likely pebble that caught the sun. No steelies. I did amass a small collection of spikes that had worked their way loose from the ties. Never did figure a use for them. But they were cool. The game was marbles. Way we played it in upper Michigan was to draw a chalk circle on the cement or scratch one on the sand with a stick, sometimes we even used a length of string. The battleground was set. The players approached cautiously if their stock was low or boldly if their marble bag brimmed. One boy against one boy. Man against man. A test of skill and mental grit. Incidentally, only boys played against boys, girls against girls: this was back in the day when adults didn’t burst a spleen for kids noticing the obvious differences in the sexes. Besides, boys were daring and cavalier. They were out for conquest. Girls would sometimes—this still baffles me—agree to play to a draw! Even if one girl would outright win she wouldn’t claim her prize. Bizarre creatures. First boy, if he was a pro, placed his middle finger against his thumb and then snapped it at his marble, aiming to smack it into his opponent’s. If he hit it, he got to keep it. No time outs, no I-wasn’t-readies, no whimpering. Newcomers and cowards could be identified by the anemic way they smacked their marble, say by giving it no more than a half-hearted push with their forefinger. Strategy was obvious. If you were the better shooter, you attacked attacked attacked. Go right after the other guy. Intimidate him. Like Nelson, ignore all subtleties and blaze away. Cagier boys took advantage of the braggarts and only pretended to be cautious. They let their opponents open with a bold shot or two, answering with a shot away as if in retreat, then when the other boy’s shot would miss and stop close by, the jig was up. And that was the problem. Too bold and your shots would come close, too close. Countless times the marbles would stop an inch away. It was a goner. This is why it made sense to shoot hard; over-shooting was hardly a risk. Unless you in a sudden-death match where shooting outside the lines meant an automatic loss. Most of us neither lost too many nor gained too many. But a few kids were easy pickings. Every day they’d come with a new small bag (these were sold in grocery and ‘dime’ stores) and lose them. Rich kids. Unless by prior agreement, only even matches were allowed. Cat’s eye against cats eye were the lowest, entry-level bouts. Cats’ eyes, for those monumentally ignorant of Americana, are the clear marble with the squiggly, colorful aberration running through the center. These were the general stock, like ten-year-old used cars; useful, but unloved. Why, you could find spare cat’s eye rolling around behind the home room teacher’s desk. What counted was quantity. Perries, probably a corruption of puries, solid colored beauties. These were always just a shade smaller than the cat’s eyes. Perries, though coveted, had a tendency to chip, sometimes even crack open when hit hard. Clears were solid glass, no color. Steelies were polished ball bearings. I only ever saw two of them. Not the railroad kind, but small ones from who-knows-where. They were said to be unbeatable, which is why we latched onto any rumor of a source. We used to empty our marble bags and compare, holding our treasures up to the light for the kind of close scrutiny used by gemologists sizing up wedding rings. Oddities such as pea-sized perries occasionally showed up. These were said to be from China, then still a mysterious land. I don’t guess kids play marbles anymore. Unless there’s a marble “app” for their cell phones. But it now makes sense that my favorite adult game is petanque. I lost my marbles a long time ago. Marbles had a very short season in my school yard. More often we would play Closest to the Wall, first with our hockey cards during hockey season and then our baseball cards when they were available. Of course we played for keepsies unless both players agreed to play for fun. During the fall, the big game was Conkers. It was played with a horse chestnut on a string. Each player took turns hitting the other player’s chestnut until only one was left. Of course everyone cheated by hardening their prized conker anyway they could. I don’t see any of these games being played anymore. Found a couple of apps that sort of look like marbles. Probably a communist invention. Steve E, same for me through elementary school. Then we left those games behind for baseball, football, and hockey. I got my horse chestnuts from huge old trees along the road in front of the state prison. The trick was to harden them slowly so the seed coat shell would shrink with the nut and not crack so easily when it struck another nut. To that I would add “no hunching”…remember that? You had to keep your knuckles in contact with Mother Earth when shooting. Regarding “boulders”…in those days they were commonly used to crown the lamp shades on fancy table lamps like your Mother would have on the table in front of the parlor window. That boulder was sacrosanct, of course, but NOT the ones on top of the lamp shades at the funeral parlors. My cousin Mikey and I used to attend a lot of wakes (like good little altar boys). I was the lookout and he did the snatching. I sure hope that we aren’t going to rot in Hell for robbing marbles from the dead. We (my brothers and cousins) played different marble games. We dug 5 shallow holes marking the South, West, North, East and Center in the dirt ground. Each player starts at the South point (S) trying to land their marble into each hole clockwise back to S, and then again, counterclockwise back to S. The one who completes the task first wins and takes all other playerâ€™s marble. So, if you donâ€™t win, you only lose one marble per gameâ€¦ no crying for losing. If you successfully land in a hole, you may continue playing. Otherwise, it’s the next player’s turn. If you land in the Center, you have to start all over at S. The holes are shallow so that if you shoot too hard, the marble will roll out the hole. Skills required! You can also hit your opponentâ€™s marble to move it away from its target. Itâ€™s fun to be a kid! Moon aggies were the Platinum Level of marbles, and were used exclusively as a “taw”, or shooting marble. Moon aggies were actually marble-sized agate spheres. Occasionally, a particularly hard impact with another marble would result in a small, crescent-shaped surface fracture or “moon”. Moon aggies with many moons were usually the possessions of marble players operating on the level of “Fast” Eddie Felson of cinematic fame. When some new kid pulled out a scarred moon aggie, you knew the level of play just ratcheted up. 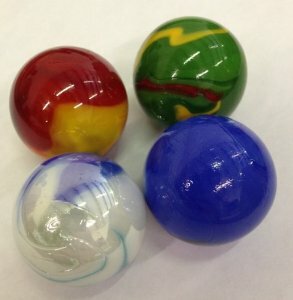 I played marbles in the 2-5 grade at Eugean Rankon Elementary school in Asheville, NC. No one played it in Jr. High. We would draw a large circle in the dirt, and put in the center the number of marbles it cost to get into the game, after we shot our shooters across the circle to determine the order of shooters. The closest one to the line got to go first, exits. You had to finish the game with the shooter you started with, so you seldom seen the big marble being used as shooters. When and if you knocked a marble out of the circle it was your marble, and you got to shoot again if your shooter stayed within the circle. A really good shooter could take out a lot of marble before his marble went outside the circle. Then the shooter had to wait for all the other shooters to shoot before he got another turn. Our games were devided by different rule, which you had to agree with to play. There was the “For Fun” games in which each player got the same number of marbles back at the end of the game that he had put in as the game started. There was the “For Keeps” games in which you got to keep every marble you knocked outside the circle. There was also the fudging and no fudging rule that had to be agreed to, or if you had to shoot from outside the circle, or if you could put your little finger on the inside of the line as you shot. Fudging was the little extra boost you got by shoving your hand forward as you shot. If it was a no fudging game you lost your shooter if cought fudging. Another game we would play was called chasers. After deciding who would shoot first the played would shoot his marble in a strate line ayaw fir the shooters, the second shouter thae shot at the first shooter’s marble tring to hit it. TRhis could be for funs or for heeps too. You won the marble just by hitting it. I never saw a girl in a game of marbles. In southern Michigan we held the marble with the index finger curled around it and shot it with the thumb. We had an associate pastor for a couple of years that we’d be tempted not to like, because he’d reprimand altar boys (that’s right, ‘boys’, not servers) right out loud in the middle of Mass if they made a mistake. But he’d also come by during recess and teach us how to shoot marbles and would hit baseballs over the church steeple, so he was cool. I still have a soft spot in my heart for crotchety priests. As long as they’re crotchety about doing Mass right. Cub Scouts have marble contests every year. Dreaded by parents. They can last forever. The marbles aren’t personal though.